The Montecristo Open Regata is a perfect short medium cigar, of Forum format, of 46 ring gauge, 5.3” (135mm) long and comes in a box of 20 cigars. Released in 2009 as part of the Open Series, intended for golf players, sailing or fishing aficionados, it is a beautiful cigar that is mellower than the regular cigars of the brand. Its mild tobacco flavor, the rich white pepper, its woodiness and savory woody cedar flavor make it an amazing pre-lunch smoke. Those cigars also benefit from at least 2 years of aging as they will mellow out and offer more complexity in terms of flavors. Perfect for a summer day. The Montecristo Open Regata is a very good option for a medium cigar for an afternoon smoke. •	Well constructed cigar, with typical Cuban flavors of wood, spices, hay, leather and nuts. •	2 to 3 years of aging are recommended for a smoother cigar. 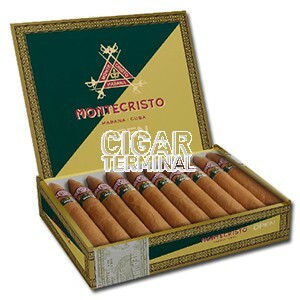 This cigar simply delivers an accessible Montecristo experience that will also appeal to the experienced smokers. The cigar is looking amazing. At first, it looks like a shorter and thinner torpedo, like a shorter No.2. The wrapper has a nice light chocolate brown color, a colorado according to wrapper classification, that has a minimal amount of visible veins, nothing major. And there is a nice thin layer of oil on the wrapper. The cigar is firm throughout; it feels dense and heavy in hand. The quality of rolling is flawless; the tip of the head is perfect. The Open Regata comes with a second band of classy green color with the Golden letter Open and the vitola name. At cold, typical Cuban smells emanate from the foot, some sweet and sour cedar and tobacco. Once cut, the cigar reveals a great draw, with woody (mostly cedary) flavor. The cigar gets light up easily, the first draw gives some strong woody flavor, coupled with some floral characteristics (mix of hay and lemon grass) and some burnt sweetness on the finish. The burn is even from the beginning to the end, a bit wavy at times, but it self-corrects. The ash builds up firmly at the head, reaching almost an inch-long, with a light gray color. Smooth smoke clouds billow from the cigar. Right away, the cigar starts as medium to full body with clear woody flavors, much like oak and there are also some chocolate notes. Few draws on, the dominant flavors are of strong cedar, tobacco, and spices. There are also some hints of hay and some burnt sweetness. The middle third is now a tad smoother, at a medium body, but the flavors evolve into a darker profile, there are some strong leathery flavors, musty notes and still the clear wood flavor. There are now more spices, some sweet earthy note and with the addition of a nutty profile, some hazelnuts. There are also hints of licorice. The cigar burns still very well, no issue on the draw, the burn doesn’t require attention and still a nice smooth smoke. In the final third, the nutty flavors disappear, and what remain are the flavors of tobacco, hay, cedar. The spices ramp up, some white pepper and some cinnamon notes are coming forward, while some hints of coffee appear. The strength remains in the medium body for the final third. In summary, it is a great smoke that is fairly complex and rather short to smoke.